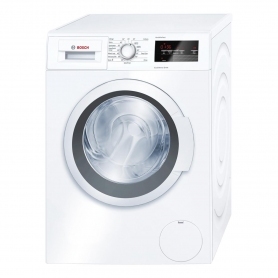 With the white WAQ28490GB VarioPerfect washing machine by Bosch, you can choose between speed and energy efficiency. 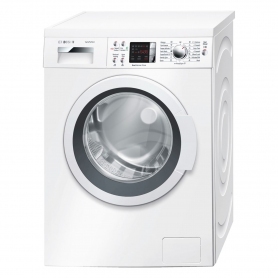 This machine offers a large 8kg wash capacity, perfect for heavy loads with items like bedding and jeans. Delivering total flexibility, Bosch’s specialist VarioPerfect technology means you can wash that work shirt in much less time – perfect when you’re in a hurry. This innovative feature also allows you to wash clothes using less energy - ideal for families who use their washing machine on a daily basis, and want to keep an eye on their energy usage. The WAQ28490GB has a range of programmes to whiz through your laundry with ease. Need something washed quickly? Try the SuperQuick 15 cycle, for clean clothes in no time. Had a heavy gym session? Chuck all your kit into the WAQ28490GB and pop on the Sportswear programme for a thorough clean. With a great choice of other programmes including Allergy+, Delicate/Silk, Cottons, Dark Wash and EasyCare, you’re bound to have the right cycle for your load. With a clever EcoSilence Drive™, the brushless motor is quiet, yet still holds power and durability to wash clothes effectively time after time. Built to last, it ensures minimum wear and tear, giving your machine a longer life expectancy. This is reflected in a 10-year guarantee. Saving time as well as money, the Bosch WAQ28490GB reaches its peak performance quickly, so you’re not waiting hours for your load to finish. As well as using less energy, thanks to Bosch’s ActiveWater management system, only the exact amount of water needed is used for each load. Accurate flow sensors ensure that each load is accessed individually, so if you’re only washing a couple of shirts, you can be sure you’re not wasting any water. You've just put a load on and the kids come home covered in grass stains - stop, breathe and reload. The handy Reload function allows you to add items to the wash even after the programme has started. Simply press the Start/Reload button and, by the time you've got the kids in clean clothes, the door will be unlocked and ready for extra items. With an A+++ energy rating, this machine uses very little electricity, giving you one less thing to worry about. The WAQ28490GB is also made with a stylish white finish, as well as exclusive door styling and chrome details. Wash clothes effectively and efficiently. Buy your new Bosch washing machine today.